If you're looking for a killer fantasy football championship belt for your league in 2018, then you've come to the right place. Today I'm going to reveal to you the 8 best fantasy championship belts on the market. Specifically, I'm going rank and thoroughly review the top 4 standard fantasy belts and the 4 leading custom fantasy belts. So who sells the flashiest, most customizable fantasy championship belts and what makes those belts superior to the lesser knock-offs? Read on to find out. For 2018, I decided to split my review between standard fantasy football belts and customizable fantasy football belts. Whereas standard belts are sold as-is, and usually contain generic graphics, customizable fantasy belts can be manufactured to include custom text and imagery that you provide. I've found that more and more fantasy football leagues are looking to create one-of-a-kind belts. Because of this, I decided to evaluate the best custom fantasy belts separately. Here is a quick summary of the standard belts I'll be covering in this review, along with my rating. If you want to check the current prices on these belts, just click on the product links below. You can also click the Read Review link to jump to my comprehensive review below. Here is my all new list of the best custom fantasy football championship belts. I reviewed custom fantasy belts a little bit differently this year, weighing the breadth of customization options more heavily than other features. Again, you can check current prices by clicking on the product links below. You may be shocked to learn that customizable fantasy belts actually aren't that much more expensive than their generic belt counterparts. Does a fantasy football title belt make sense for your league? If you've been a fantasy football enthusiast for any length of time, you're probably a bit tired of the same old trophy being passed around from year to year. Even the best fantasy football trophy can seem a bit dated in 2018. Luckily, there are now superior, modern prize options available to give your league some newfound swagger. One of those is the fantasy football championship belt. This unique prize alternative is the latest rage in the fantasy world. Several companies are making football championship belts that are stylish, appropriately gaudy, and high quality. Sure, it might seem like a ridiculous fantasy football trophy concept to the prudes of the world. But this game we play is also a bit ridiculous, so they actually make an excellent pairing. When searching for the best fantasy football championship belt for your league, there are a few essential factors to keep in mind. FFL Championship belts can be more expensive than other fantasy prizes so you want to understand your options before buying a belt. Cheap fantasy football belts are becoming more and more commonplace. You want to be sure that if you invest your league's hard-earned money into a championship belt, you will get a belt that will last. Let's evaluate these factors to ensure you have the necessary knowledge to get the best football champion belt for the best price. Belt plate construction: Avoid belts featuring cheap or plastic plates. Metal plates are the standard, and the thicker the plates, the better. Merchant reputation: Limit your choices to merchants with the best reviews and satisfied customers. Belt manufacturers come and go. You want to pick a merchant that will be around should you need them. Belt strap material: Genuine leather is better than synthetic (PU leather), but also harder to find and priced at a premium. Still, PU leather is the standard and is usually adequate. Price point: As you'll see in this review, affordable championship belts can be found if you do your homework. Identify your must-haves, then buy the belt that provides the most value given your budget. Customization options: If you want to record league champions on your belt (or even engrave your league logo), I've got you covered. I devote an entire section to strictly reviewing custom football belts. Championship belts first started appearing on the market around a decade ago and have been growing in popularity ever since. They've always been a bit pricey compared to your typical fantasy football prize, but the cost per year can actually be quite low if you consider a customizable belt that can be passed from champion to champion. In talking to other fantasy players, and owners in my own leagues, there is usually some debate about whether a fantasy title belt is a ridiculous idea for a fantasy prize. 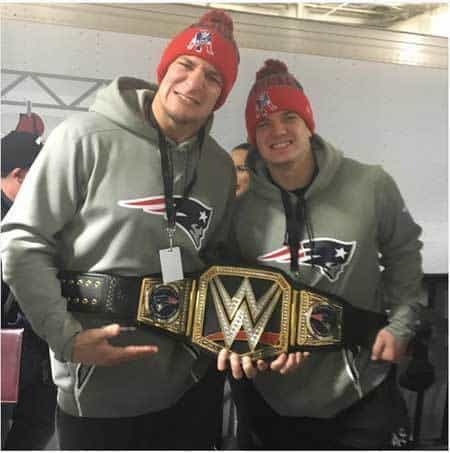 For those who think the idea is bizarre, I point to the New England Patriots who were presented with their own NFL Football Championship Belt from the WWE following their 2016 Super Bowl victory. The WWE has made a tradition of awarding a yearly FFL championship belt to the Super Bowl champs. Why should your league be any different? You gotta admit, it looks really cool and shiny. Almost all fantasy belts sold these days are made of either real, genuine leather or PU (Polyurethane) leather, a popular synthetic leather. Real leather is always better than fake leather, but be prepared to pay a bit more for this option. Unless you have expensive taste, PU leather is probably more than adequate for this type of fantasy prize. In all likelihood, you'll be pulling this belt out once a year to rub it into your league owners' faces. You won't be wearing it to your day job riding bulls. Because fantasy belts are almost always sold by the same companies that manufacture fantasy trophies, the plates adorning commercial belts are almost always made of metal. More times than not, this metal is thick aluminum and adequately durable. Football championship belts have finally matured to the point where they can be re-used like perpetual fantasy football trophies. That is, many belts support blank metal plates that can be used to engrave championship team names or league graphics. 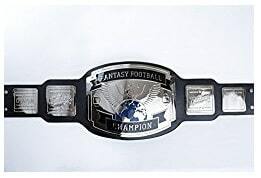 Although fantasy championship belts are pricey, the fact that you can re-use them year after year makes them much more attractive to leagues on a budget. For instance, if you usually spend $50 on a yearly trophy, it can actually be much more cost-effective to purchase a title belt and pass it between league champions. In that way, it becomes a bit of a fantasy football perpetual belt. As an example, the belt plate shown above from Fantasy Jocks can be used to record league champions for several years, eliminating the need to buy a new prize every year. Although customizable fantasy football championship belts are a relatively new concept, more and more merchants are starting to produce them. The placement of the customizable plates (or inserts) and the space available for your graphics will vary by belt and vendor. One custom fantasy football championship belt in this review is so flexible that you can virtually design all of the belt graphics on your own (including the center plate). These types of customization options were unimaginable just a few short years ago. You're now only limited by your imagination. 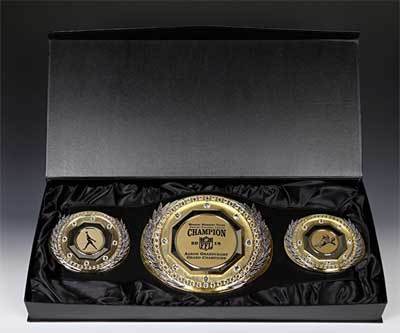 Fantasy football belt trophies are sold as a one size fits all product. Most belts Incorporate metal snaps which allow the belt to be adjusted based on waist size. Each belt I review below is at least 50 inches in length. That means they should fit anyone with a numerical belt size of 50 or a general waist size of 4XL (or smaller). This enables fantasy belts to become perpetual prizes because they can be passed between owners withing worrying if they will fit. That isn't the case with a fantasy football ring, for instance, because people have varying finger sizes. The top four fantasy football trophy belts are each from merchants that specialize in the creation and manufacture of fantasy league prizes. I chose these belts based on their competitive price, superior materials, and the high level of customer satisfaction. I cover the main features of each belt, while also summarizing its best and worst features. Let's get it on! As I stated in my latest Fantasy Jocks Review, they are one of the top fantasy sports merchants on the market. From their draft boards kits to their championship rings and belts, they consistently produce unique, high-quality products for fantasy football leagues. So not surprisingly, Fantasy Jocks has the most massive fantasy football league belt in this review. For leagues looking to make a statement, look no further. This belt sports a total of five metal plates, the center plate measuring a monstrous 12" x 9.5". If you like the overall style of this belt, you'll be happy to know that the Jocks offer four belt styles and color combinations to choose from at checkout. That's one for just about every outfit in your closet. Undisputed Belts does offer several different fantasy prizes but does one thing particularly well: they manufacture beautiful and affordable fantasy football championship belts. If you agree and would like to take a deeper dive into their extensive line of championship belts, check out a few of the Undisputed Belts reviews online. The Spike Belt is their signature, belt and as you can tell from the picture, it's a formidable piece of fantasy attire. 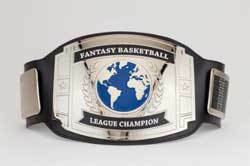 This fantasy league championship belt measures 55 inches in length and is entirely adjustable to fit any champion's waist. The front metal plate measures 11" x 9" inches, which is truly massive. If you need any more reassurance that this is a top-quality belt, consider that Undisputed Belts is the official fantasy championship belt provider for NFL Network Fantasy Live, NFL AM, and many other high-profile fantasy leagues. This fantasy football league championship belt from Decade Awards spares no expense when it comes to quality. It's made of genuine leather, a rare feature for a belt that is actually very affordable. However, I'm not a big fan of the three plate design. Most fantasy football belts with name plates have five plates standard, which I think looks more much formidable. But I think Decade Awards makes up for this with the thickness of the plates. 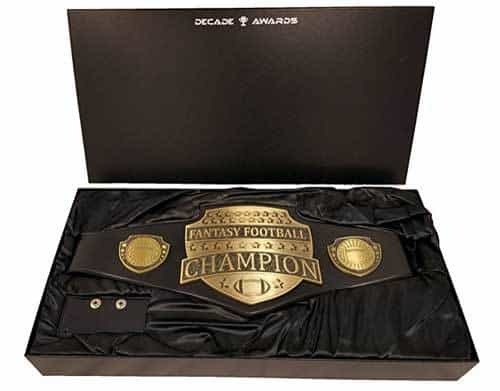 If you're looking for a cheap fantasy football championship belt that is also completely customizable, this belt from Decade Awards could be a worth a look. Compared to the other custom belts in this review, this belt is a steal. Also consider that when you buy this fantasy belt, you don't get just the belt. You also get a wall hanger and a custom display case. That means when you're not pimping the belt around the neighborhood, you can still display it proudly. This gemstone-encrusted fantasy football trophy belt from Crown Awards is undoubtedly the most unique belt in this review. Whereas the other vendors have focused on making hulking fantasy football champion belts with lots of metal, Crown Awards went the other direction to create a belt with some glitz. Another feature that sets this belt apart is that, while much of the belt is made of a zinc metal alloy, the plate artwork is inserts. This means you can swap them out to support another types of sports or events. Additional inserts can be purchased from the merchant's website. Again, I'm usually not a fan of the three plate design. But because this belt is already going in a unique direction, I feel like it's a fitting feature. Due to the glamorous feel of this belt, I think it would be a excellent prize for a women's' fantasy football league. This gemstone belt is frequently sold out on Amazon but strangely doesn't have any reviews. Maybe men are buying this belt, but don't want to admit it? Consider all the desirable features of a fantasy football belt: quality, design, size, merchant reputation, and customer satisfaction. One belt in this review hits all of these points at a reasonable price. That is the fantasy football belt trophy from Fantasy Jocks. Although it isn't the cheapest fantasy title belt in this review, it is the biggest belt which goes a long way when you're looking to make a statement. Customizable fantasy football belts are all the rage, and new merchants seem to be entering the market every year. As such, in my evaluation of these custom belts, I considered both design options as well as vendor reputation very strongly. Undisputed Belts is the undisputed champion of custom fantasy football belts. 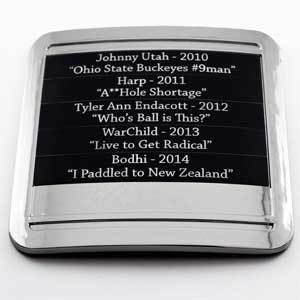 That's because they're the only merchant that lets you completely customize all five of their metal plates with any design that you choose. Creating a custom design is as easy as uploading your images at the time of purchase. There are tons of sample custom belts on their website from which to draw inspiration. Even if you're not the most artistic person in the world, don't sweat it. Undisputed Belts will provide you with a proof of your design to make sure it meets your needs. Even better, they allow for unlimited revisions. Here is a graphic detailing their belt design process. While Fantasy Jocks hasn't quite cracked the code on fully-customizable belts just yet, this versatile belt is a step in the right direction. But you should be aware of a few shortcomings. First, on the main plate, you can only customize the top and bottom banner text. The imagery on the main plate itself cannot be customized. This can be very limiting because most people looking to buy a custom fantasy belt want to design the middle plate most of all. If you're looking for a fantasy football championship belt with nameplates, and have less than 7 years worth of champions to be engraved (or just plan on engraving your league logo on a side-plate) this belt should be more than adequate. Also, you can always purchase additional blank nameplates from the Fantasy Jocks website and affix them to your belt as needed in the future. This custom fantasy football belt from SLD Awards is another belt that is completely customizable. Again, this is a crucial feature if you want to integrate your league logo or graphics onto the center plate. While the plates on this belt appear to be a decent size (center plate is 10" x 8.5"), only a small portion of the plates are actually engravable. If you just want to add graphics and not league champions, that may not be a big deal. If you need more space, I'd strongly consider the custom belt from Undisputed Belts. One thing the SLD belt does come with, that Undisputed and Fantasy Jocks do not, is a free display case. And it actually looks really nice. This custom fantasy belt by Trophy Partner also allows for each of its plates to be customized. But it deviates from the standard customization process in that it doesn't actually etch your design onto metal plates. 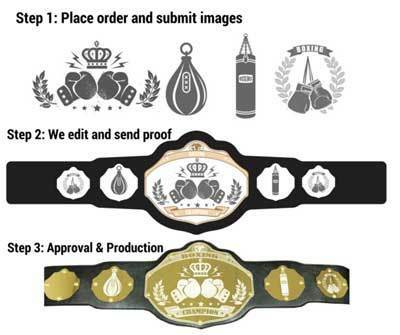 Instead, Trophy Partner takes your submitted artwork designs and creates poly-domed emblems that it integrates into your belt. This process adds a thick layer of transparent material over your artwork so that it cannot be damaged. While unconventional, this design process is useful if you want to add some color to your belt graphics, something that can't be done when etching metal. This fancy belt has a detailed, 3D design and incorporates 32 clear synthetic stones to give your belt some extra bling. It also comes with a free display case. When I think of a customizable fantasy belt, I think of something that is indeed one of a kind. I want a belt that does not limit my imagination and lets the creative juices flow. Because of this, the natural choice for the best custom fantasy belt in 2018 is from Undisputed Belts. Not only is this the only truly 100% customizable belt with five plates, it's actually very affordable compared to other custom belts in this review. It's a great product. Brad is a software developer and has been running successful fantasy football leagues since 1999. When he isn't playing fantasy football, he's writing about fantasy football.